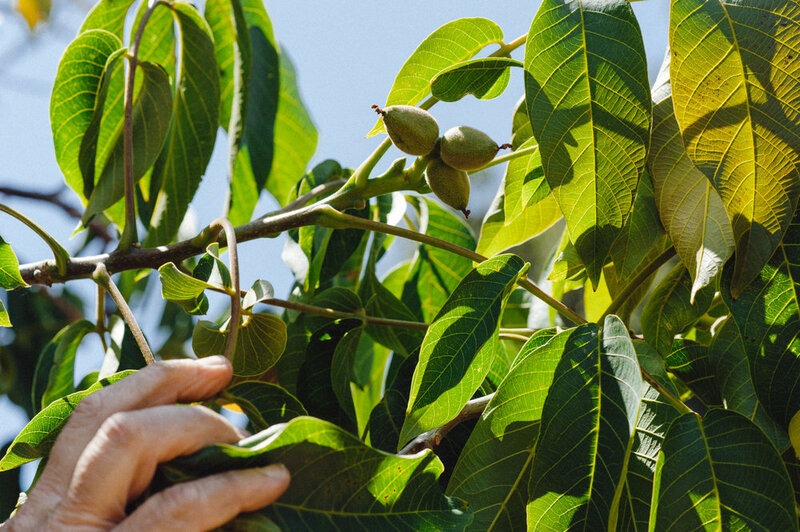 Manzanita Manor (or MMOrganic for short) is known for producing delicious, organic, dry-farmed walnuts in Paso Robles. 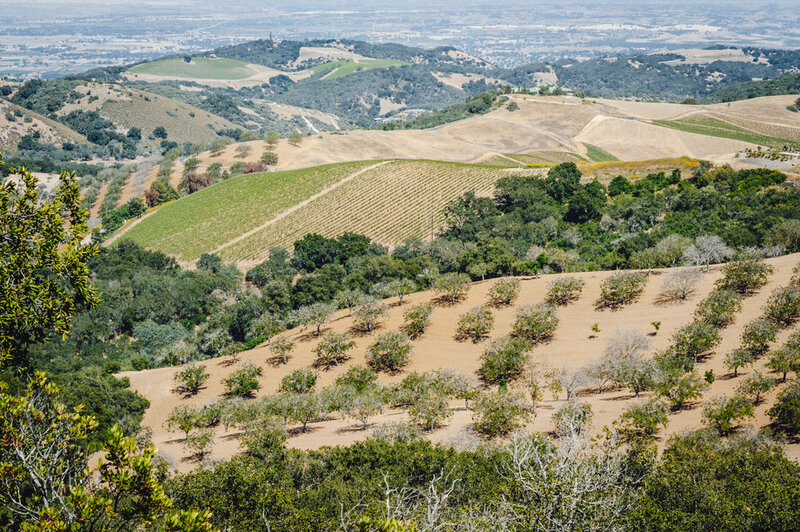 It all started about 25 years ago when Jutta Thoerner and her partner Cynthia Douglas bought an 80-acre parcel of land in Adelaida, half in walnuts and the other half as woodland. Jutta was working in a lab but as her farming enterprise started to take off, she turned to farming full-time. A few years later she and Cynthia bought two neighbors’ orchards and now they own 200 acres, half with organic walnuts and half with woodland that they leave for wildlife. It is left undisturbed except for a couple of permanent water stations, one for smaller and another for taller animals. Their land has some historic interest as it was once part of the HMR Winery and neighboring parcels were owned by the famous musician, Ignacy Paderewski. When Jutta and Cynthia purchased it though, the walnut orchards had been neglected for some time as it was no longer profitable to dry farm walnuts. 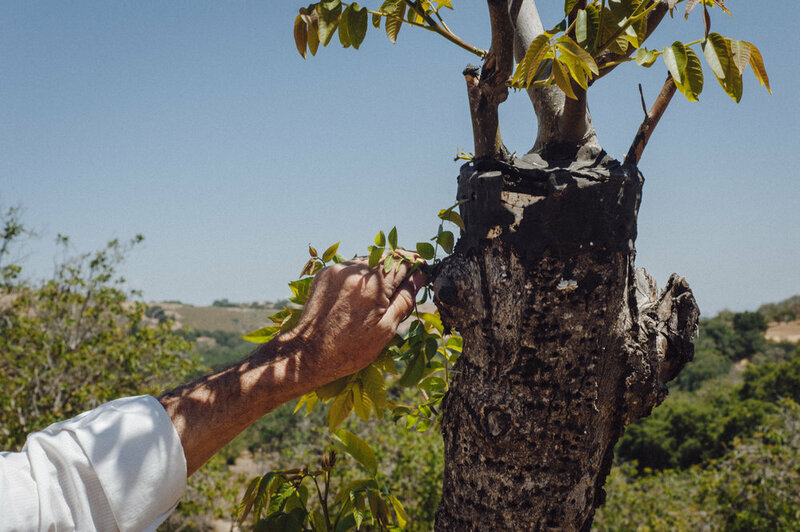 Trees in dry farmed orchards must be planted very far apart – 35’ to 50’ -- so that the roots don’t compete with each other for water and nutrients (no irrigation water is applied). Thus, the yield per acre is less than orchards that are more densely planted and irrigated. 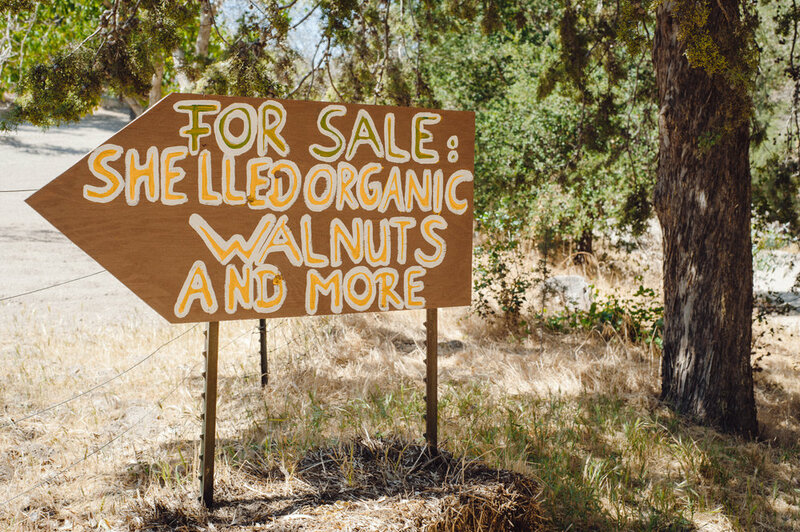 Also, most walnut growers sell their crops to a middle man to process, cutting into growers’ profits even more. So, as the orchards became unprofitable, the trees were not maintained and eventually the owners sold their land and retired from farming. JUTTA THOERNER AND CYNTHIA DOUGLAS IN ONE OF THEIR WALNUT ORCHARDS. Photo courtesy of Manzanita Manor. A lot of work was needed to restore these orchards. Many trees had died, so the first year Jutta and Cynthia planted 250 black walnut rootstock, and then grafted scion wood (cuttings) from the heirloom varieties of English walnut trees in their orchards. Over the years Jutta has had to replace many more trees that were lost to the drought as well. It takes ten years before newly grafted trees will bear walnuts. 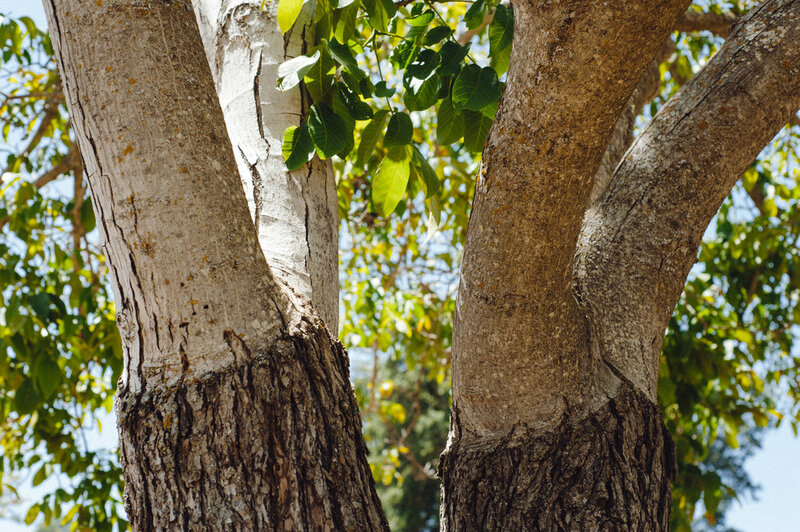 The Manzanita Manor orchards are organic and it is difficult to be both organic AND to have a clean crop of nuts. To do this, Jutta buys and hangs traps for the various insect pests. Some traps have pheromones to attract insects, others are baited with a bag of walnut meal. Sanitation is also very important; this means that after the harvest, walnuts cannot be left on the ground so that insects have a place to overwinter. All of the walnuts must be cleaned up. This is when the wild animals step in and help by eating the fallen walnuts that the harvesting crew has missed or that have been run into the ground by tractors. The walnut orchards require attention year-round. In Jan-Feb, rootstock is planted to replace any trees that were lost the prior year. In the spring there is a narrow window of time after the last rains and before the soil is too dry when the soil is disked to eliminate weeds and to create a fine dust mulch. This mulch helps retain moisture in the soil. In late spring, Jutta grafts her own cuttings to the rootstock planted earlier in the year. She covers the new grafts with chicken wire and shade cloth, to defeat both the deer and the sun from damaging tender new growth. May is grafting time and hanging various paper traps in the orchard. In October and November there is a 3-4 week harvest period. This is more labor intensive for Manzanita Manor because the orchards are on a steep hill, so while the trees can be shaken, the fallen walnuts can’t be swept and vacuumed as they could be on flat terrain. Instead, crews have to pick them up by hand, adding to time and labor cost. After harvest, Jutta is busy until the end of the year with cracking, shelling, and drying the walnuts. Part of the walnut orchard. Photo courtesy of Manzanita Manor. Tree grafted one month ago. Photo courtesy of Manzanita Manor. Tree grafted many years ago. Photo courtesy of Manzanita Manor. Lily and Sunny working the orchard ground. Smoothing out dirt clods will help during harvest when the walnuts fall. Photo courtesy of Manzanita Manor. Norwegian Fjords Lily and Sunny deserving a rest. Photo courtesy of Manzanita Manor. Triple set of walnuts indicate a good harvest is coming! Photo courtesy of Manzanita Manor. Honor farm stand on the corner of Adelaida Rd. and Hidden Mtn. Rd. outside of Paso Robles. Photo courtesy of Manzanita Manor. Jutta was able to buy her own small walnut cracker from a grower who retired and this and the dryer and husk remover have been a great benefit because they allow her to process her own nuts, and not have to truck them elsewhere and pay for processing. Because her equipment is small and she doesn’t have people working for her other than at harvest time, she is only able to process her own walnuts and not other growers’. To keep the shelled walnuts fresh, Jutta does two things: she dries the walnuts at a low heat, which means that it takes longer to dry than conventional processors, and she also keeps her walnuts in cold storage. Before she had her own dryer, she used to dry them in the sun, which takes even longer but works perfectly well – as long as the weather is dry! If refrigerated, shelled walnuts will keep a year and in the freezer they will keep for two years. For some years, Jutta also grew wine grapes and produced a port-style wine. It was the only certified organic port-style wine in the USA that she knew of but as the walnuts became more profitable, Jutta had to focus on the orchards and isn’t able to produce the wine anymore. However, we do have some of Jutta’s limited supply here at the Co-op! Except at harvest time, Manzanita Manor is a staff of just two people: Cynthia does the bookkeeping, bills, handles the finances, bagging and shipping. Jutta does the hands-on orchard care, packing, labeling, delivering, and correspondence. 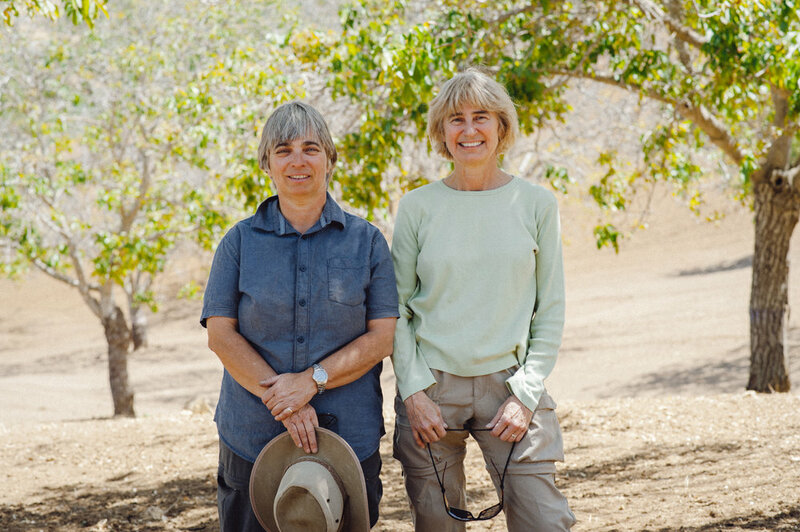 When asked if there is anything else she would like readers to know, Jutta said that she and Cynthia are grateful for the people who buy organic; it is more money than conventional crops but these customers make it possible for small farmers and orchards like Manzanita Manor’s to exist. These customers are the lifeblood of a small farmer. Thank you to everyone who buys local and organic! For more information, please visit Manzanita Manor’s website and follow them on Facebook for their latest news!